I often get what I call “gratitude bubbles.” Gratitude bubbles are those fleeting moments when the whole world around me seems to shimmer, I am intensely aware of being alive, and how lucky I am in so many ways. I never know when they are going to appear, and I can never predict what they will be about. But they are glorious in their unexpected fragility. Last night was a lovely example. I had booked a private party about 100 miles away from home. It was a two-plus hour drive there, seven solid hours of reading twelve people with only a ten minute break halfway through the proceedings, and the same two-plus hours drive back. It was 8 p.m., and I needed something to eat, so I detoured to our household’s favorite restaurant, Tops Diner. I gave Carle a quick call to let him know not to worry if I was a bit later than expected. Normally, when Carle and I go out on Date Night, the parking lot is full and the restaurant is bustling. But tonight, the lot was eerily empty. I pulled in, wondering did they close early? The quiet was surprising. But open they were. When I walked in, the front-of-the-house crew welcomed me with delight. Since our usual waitresses, Amy and Darlene, were off, I got to meet Michelle. And my simple order of hot tea and a BLT came out almost immediately, perfectly prepared and a bit “generous” in terms of the bacon, with a side salad of coleslaw, since I was a regular and the kitchen wasn’t busy. I had the time to savor my meal slowly. I had the chance to decompress from dispensing wisdom and compassion all day. I wasn’t rushed. I was gently checked on by Michelle as appropriate. And it was food I didn’t have to prepare at home after that very long day. Perfection doesn’t have to be a big event, or something long-planned. When we are mindful, keeping our focus on the present moment, these gossamer bubbles of exquisite peace can be found around every corner. I’ve ordered their BLTs before. I eat at that diner often, and coleslaw is a fixture on sandwich plates there. The waitstaff is excellent, and the restaurant clean and modern. I’ve had hundreds of enjoyable meals there. But last night, everything came together in a quiet moment to gift me with a moment of perfect gratitude, which left me feeling replete, nourished – and loved. 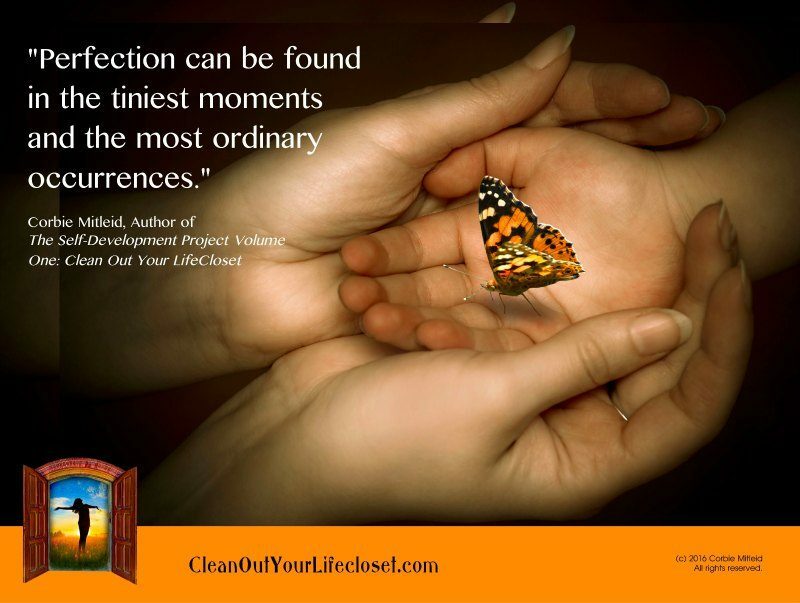 When we take the time to mine the treasures of our lives, the brief moments here-and-gone, we can be stunned at our good fortune in finding so many moments of perfection. Today, enjoy seeking out your personal “gratitude bubbles” waiting to float into your consciousness, triggering endorphin-filled appreciation.